The Formax FD-260 Tabbing System makes applying postal tabs to folded mailpieces quick and easy. The FD-260 uses “crash tab” technology, where the edge of the mailpiece is fed into the machine where it contacts an adhesive tab and travels through a set of rollers where the tab is tightly folded and sealed, creating a mail-ready piece. With postal regulations changing, having a dependable and efficient tabber can make your mailings compliant with very little effort. The FD-260 provides a short paper path so there is no need for skewing adjustment, and high productivity because the short edge of the document feeds through the machine, increasing production rates at any given speed. Accuracy is also important with the FD-260, as the tabs fold tight to the edge of the piece, without drifting from left to right. The FD-260 tabs up to 15,000 pieces per hour, using a variety of tab stocks including clear, translucent and paper, in both 1” and 1.5” sizes, with a built-in waste take-up spool to reduce down time. Depending on document specifications, the mailpiece can be fed through in different directions, to apply tabs in various locations. The FD 260-10 Feeder is optional, and allows operators to input a stack of up to 8” of material to be tabbed with adjustable side guides to prevent document skewing. The FD 260-20 Conveyor is also available which offers adjustable speeds from 0 – 120 fpm, and stacks tabbed pieces in a neat, sequential order for easy removal. The FD 260-30 Catch Tray is also another great optional feature that provides a low-volume alternative for smaller jobs. 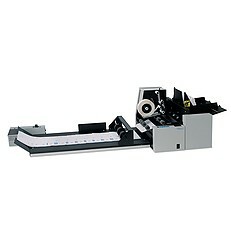 If you have any questions or are interested in purchasing the Formax FD-260 Tabbing System, visit us at SpiralBinding.com. We have great pricing on a full line of Tabbers/ Wafers Sealers. Call us at 1-800-631-3572 for more information!